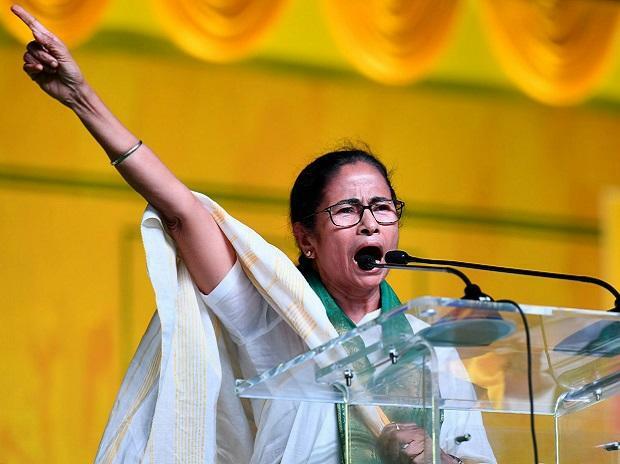 West Bengal Chief Minister Mamata Banerjee Wednesday launched a blistering attack on Prime Minister Narendra Modi describing him as "Expiry PM", and strongly contested his allegations against her as being a 'speedbreaker' in the path of state's development. Banerjee gave a point-by-point rebuttal of charges levelled by Modi at rallies at Siliguri and later at Kolkata's Brigade ground during the day, to nail the "lies" spoken about the performance of her government. The war of words between Modi and Banerjee heated up the battle of Bengal in the ongoing general election. Bengal sends a total of 42 members to Lok Sabha, the third largest after Uttar Pradesh's 80 and Maharashtra 48. Modi kickstarted BJP's campaign in the state Wednesday launching onslaught on TMC supremo. Banerjee, whose partymen see her a PM candidate, the preponed start of poll campaign in the state with a rally at Dinhata in Cooch Behar district to coincide with PM's public meeting Wednesday. Describing Modi as "Expiry Babu" and "Expiry PM", Banerjee questioned what his government at the Centre has done for the welfare of people of the country. She dared him to participate in a direct debate with her in television or in a public rally. Claiming that her government in West Bengal has done a lot for the welfare of the people of the state, Banerjee told a public rally that income of farmers in the state has increased three times under her rule. "I am not Modi,I don't tell lies," she said, alleging that the PM has made false claims on the performance of TMC government in West Bengal. She claimed that 12,000 farmers committed suicide during Modi rule in the country. The West Bengal chief minister said that her government has implemented several welfare schemes for the people of the state, like 'Kanyashree' for girls, 'Yuvashree' for the young people. "PM should not lie. You claim to have a 56-inch chest and u are resorting to lies," she said. Banerjee said that West Bengal has been awarded by the Government of India for being the best among all states in implementing the 100-day minimum work guarantee scheme. "Its not my claim but your government has given the award for the achievement," the firebrand leader said. Banerjee was termed as a speedbreaker in the path of the state's development by the PM a couple of hours back in a rally at Siliguri. Rejecting Modi's claim of doing everything for the welfare of tea garden workers, she said "you had promised to reopen seven closed tea gardens, but you have not done anything." She said that Modi had promised before the 2014 elections to give every poor person Rs 15 lakhs in their bank accounts, but has not given a single penny. Banerjee also said that the BJP government at the Centre has not done anything for the Rajbanghsis, an ethnic group with a sizeable population in the North Bengal despite having made "tall claims." Regarding Modi's accusation that Banerjee has deprived the people of West Bengal of benefits under Ayushman Bharat scheme, she said the PM was seeking all credit for it though the state government had to shell out 40 per cent of the cost of the programme. "Why should I give it to you, I will do it myself," she said. She said that her government will introduce a scheme that will benefit 7.5 crore people in the state. Charting out achievements and welfare schemes of her government that has been in power in Bengal since 2011, Banerjee said that she has introduced insurance for farmers and waived mutation fees for farmland sales. Livid at the PM's accusations against her on the Pulwama attacks and the Balakot airstrike in Pakistan, Banerjee said "we are nationalists and not fascists." She said that the Centre had prior intelligence on a possible terror attack on the CRPF convoy, but despite that the Pulwama incident happened in which 40 troopers were killed. Saying that Modi should not try to teach her nationalism, she said "you had information, but without taking action you led the CPRF jawans to death." Banerjee said that Uttar Pradesh Chief Minister Yogi Adityanath has insulted that the Armed forces of the country by terming them as 'Modi Sena'. She alleged that 'Modi Sena' are those who indulge in rioting and assaulting people who do not conform to their ways, and terming the country's Army the same is an insult to the brave hearts who serve the country. Regarding Modi's claim that her boat was sinking in Bengal, Banerjee said "Agey Delhi samla, tarpor dekhish Bangla (First manage Delhi and then look at Bengal)." Claiming that the "Chowkidar is acting like a fascist," she said "you are talking of air strike, you will see voter strike." She claimed that in Assam NRC, 22 lakh Hindu Bengali voters have been excluded, while 23 lakh Bengali muslims have been left out of the citizenship register in the north-eastern state. The chief minister said that though Modi has assured the Gorkhas in Darjeeling and other places in the state that they have nothing to worry about the NRC, she said that there are several elements in it for the Gorkhas to fear. "Go to Assam to see how many people have died and how many families have been devastated because of NRC," she said. Banerjee claimed that if the BJP government returned to power in the general elections, they will change the Constitution and there will be no democracy in the country. Claiming that the Modi government intimidates anyone opposing it by raids and other tactics, she dared the PM saying "Catch me if you can, touch me if you can." "I am also from a Hindu family. ..but I don't go by your Hinduism. My parents did not teach me this type of Hinduism where you hate people," she said.